The Road to the Horizon: Picture of the day: Drawing from Darfur. This picture was drawn by a young Chadian boy in a camp for displaced persons in Eastern Chad. 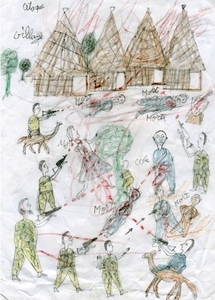 His drawing describes the attack on his village by Janjaweed militias from Sudan. On the top left hand corner of the drawing is written ‘ataque village’ (French for ‘attack of the village’). The attackers, wearing military uniforms and on camels are shooting civilians with machine guns and burning their houses. Bullets are coming from all over. Next to each civilian that is shot is the word ‘Morts’ which is the plural of ‘dead’ in French. 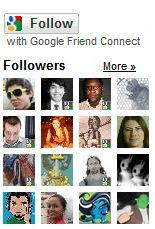 More posts on The Road about Darfur. More "Pictures of the Day" on the Road. And as always, it will take a lot of time for people, in particular children, to forget the horrors they have lived. If ever they can forget.